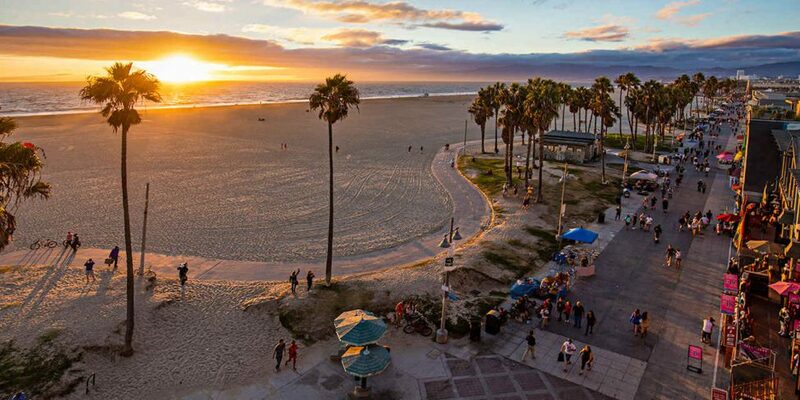 Venice is a residential, commercial, and recreational beachfront neighborhood within Los Angeles, California. It is located within the urban region of western Los Angeles County known as the Westside. Today, Venice is known for its canals, beaches, and the circus-like Ocean Front Walk, a two-and-a-half-mile (4.0 km) pedestrian promenade that features performers, mystics, artists and vendors. Venice is adjoined on the northwest by Santa Monica, on the northeast by Mar Vista, on the southeast by Culver City, Del Rey and Marina Del Rey, on the south by Ballona Creek and on the west by the Pacific Ocean. Main attractions include the Venice Canal Historic District, Abbot Kinney Boulevard, Venice Farmers Market, Fishing Pier and Breakwater.